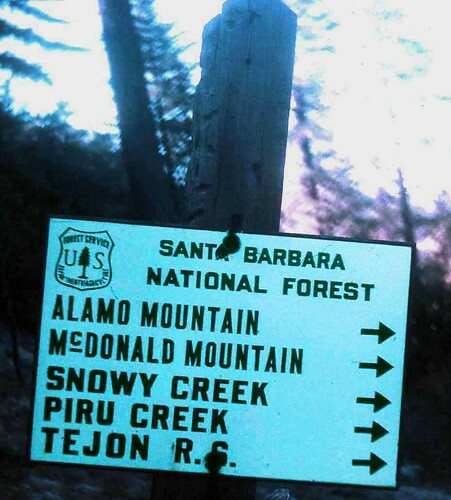 This entry was posted in Uncategorized and tagged alamo mountain, los padres national forest, mcdonald mountain, mutau creek, piru creek, santa barbara national forest, snowy creek, Tejon ranger station. Bookmark the permalink. Well that begs a real question, then … what’s the difference? Clearly the signs are steel underneath. So aren’t they enameled signs? Would porcelain imply they’re solid porcelain? A quick read on the topic leads me to believe the signs are, in fact, both … “Porcelain signs are thin sheets of metal coated on all sides with a durable glass, bonded at a high temperature. These signs were then coated with enamel to further protect them.” So perhaps in this case both terms are accurate. Porcelain vs. enamel vs. porcelain and enamel: This is now, very sincerely, my all-time favorite on-line discussion on any topic, carried on by two of the finer gentlemen of my acquaintance on- or off-line. Given that my Internet reading and posting extends back to Usenet rec.backcountry (and other fora) vintage 1988, this discussion stands out in a rather extensive contextual history.